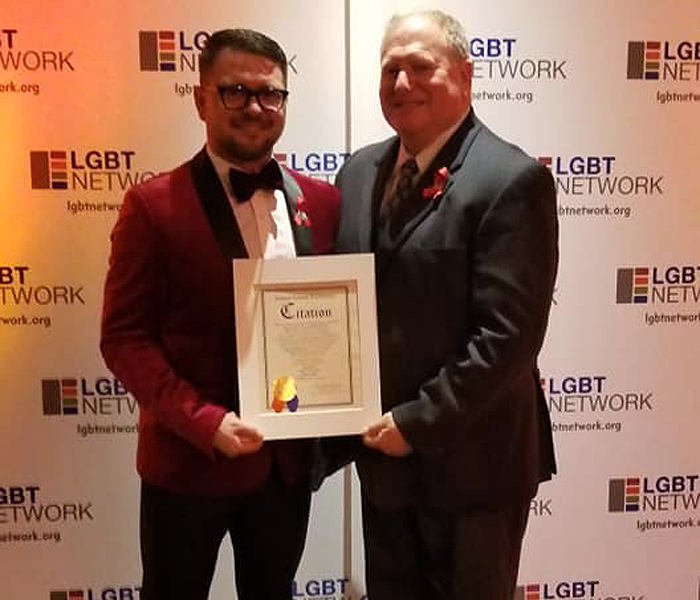 (Woodbury, NY) Nassau County Legislator Arnold W. Drucker (D – Plainview) congratulated Floyd T. Feather for being recognized at the LGBT Network’s annual Winter Ball on Friday, Nov. 30 and his efforts to fight the AIDS epidemic. (L to R): Floyd T. Feather, Legislator Drucker. Photo Credit: Office of Nassau County Legislator Arnold W. Drucker. Held in commemoration of World AIDS Day, which is observed annually on Dec. 1, the Winter Ball raises funds for the LGBT Network’s HIV/AIDS outreach, testing, prevention, education and support services. Legislator Drucker presented a Nassau County Legislature Citation to Feather, a longstanding supporter of the LGBT Network and HIV/AIDS advocate in Nassau County and Queens.